While I have my favorite RenFaire Dudley, I enjoy different filmed versions for different reasons. 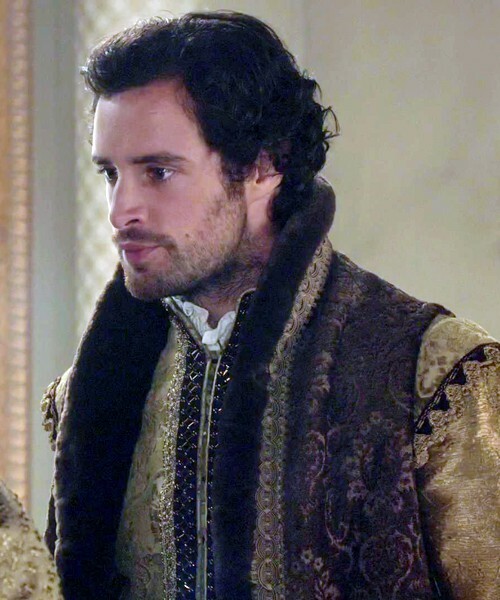 So let’s review the whole lot of Leicesters and see how they stack up as Elizabethan man candy. 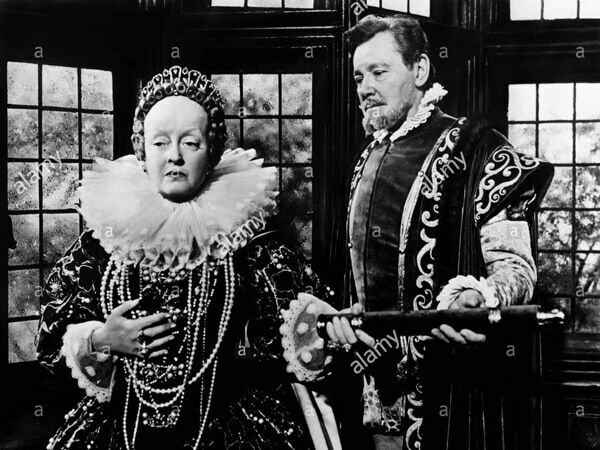 The earliest Queen Elizabeth movies weren’t so much romances as action flicks with lots of swashbuckling and derring-do, usually by pirates and/or Sir Walter Raleigh. 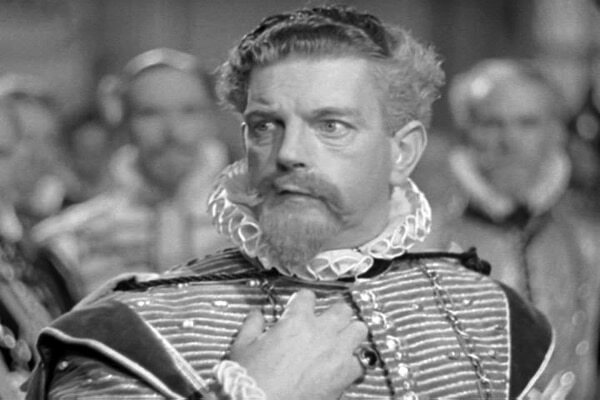 Thus Leicester only plays the role of queen’s advisor, and Leslie Banks’ portrayal includes a lot of warning Her Majesty about things and being shocked/outraged at what happens. 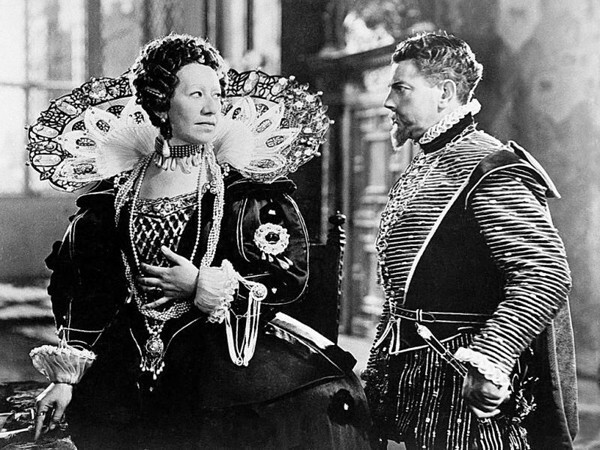 Flora Robson is Elizabeth to Leslie Banks’ Dudley in Fire Over England (1937). 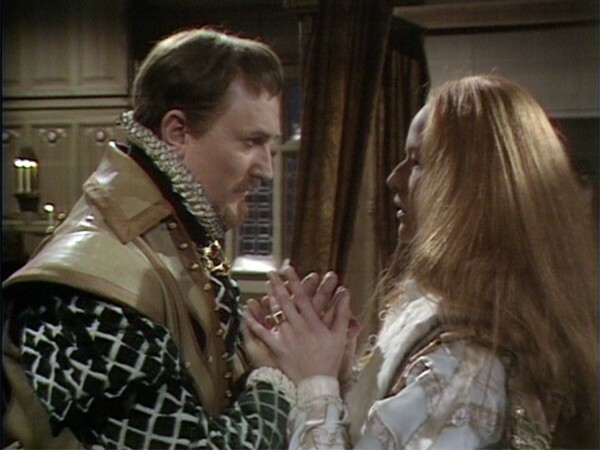 Robert Dudley’s part was pretty small here, and The Virgin Queen focused on Elizabeth’s relationship with Sir Walter Raleigh (played by Robert Todd). This is the only decent picture I can find of Herbert Marshall as Dudley! Finally, in the best onscreen biography of Elizabeth’s life, we get the best Dudley! 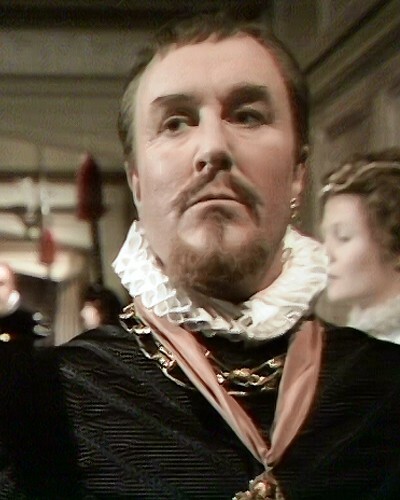 Robert Hardy may be known today as a character actor in period drama or as the Minister of Magic in Harry Potter, but before all that he was the shrewdly political Leicester. He showed the complexity, the frustration, and the depth of this character so well — the man who was closer to the queen than anyone else, yet always kept at an arm’s distance. Much like the historical writings, much is left unsaid in Hardy’s performance with Glenda Jackson, and yet there’s so much emotion visible. 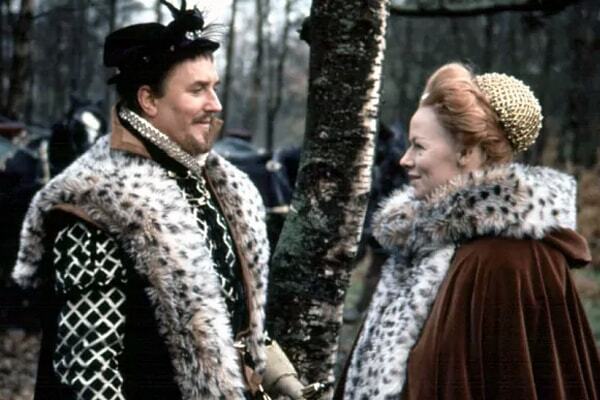 Robert Hardy as Dudley and Glenda Jackson as Elizabeth have a complicated relationship in Elizabeth R (1971). Their one kiss onscreen feels scandalous due to the reactions — including Dudley’s. No happy ending, but still so watchable. Yeah, it’s kind of weird that Elizabeth’s love life gets so much screentime in a biopic about Mary, Queen of Scots. I guess this relationship shows contrast to Mary’s marriages? Sure, whatever. This is also the movie that has the two queens meeting, so not like it’s high on the historical accuracy level. The flick does get points for having Glenda Jackson as QEI though. And now, Dudley and Elizabeth are allllll about the romance. It’s not subtle, it’s a major plotline — will she marry him or won’t she? At least we get some great masque scenes and that delightful volta. 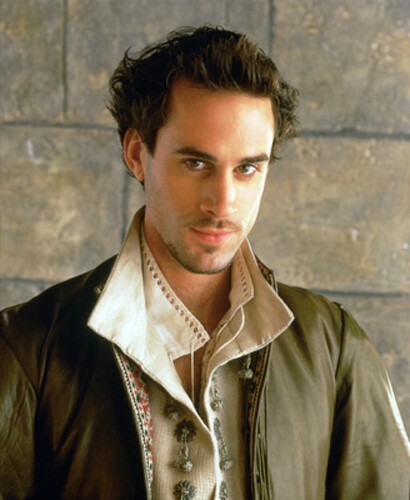 Joseph Fiennes is an OK Dudley for Cate Blanchett‘s fabulous queen in Elizabeth (1998). Awww yisss, back to the good stuff! It takes some gravitas as an actor to play this role and not make him look like just Elizabeth’s boy-toy. Jeremy Irons is well-matched to Helen Mirren here, and they give life the middle part of Elizabeth’s reign. 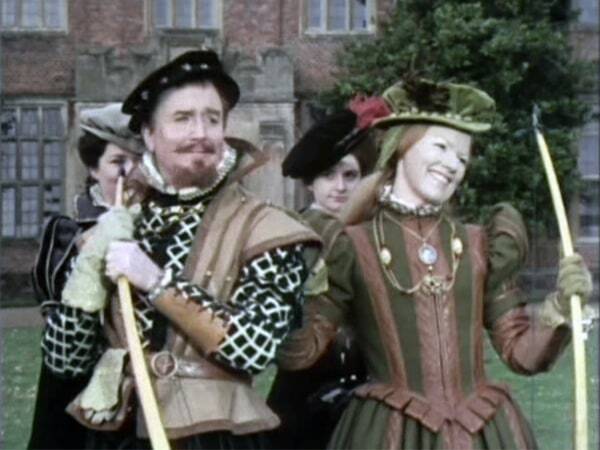 These two take on everything from court gossip to the Spanish Armada as a team, with Irons’ Dudley supporting her, supplicating to her, just as I can imagine the real Dudley must have. A believable intimate moment between Elizabeth (Helen Mirren) and Dudley (Jeremy Irons) in Elizabeth I (2005). Yes, Kendra’s favorite, but he’s really just here for the snogging, you can tell. Not a lot of historical nuance on his part, and I don’t find that he can match up to Anne-Marie Duff. 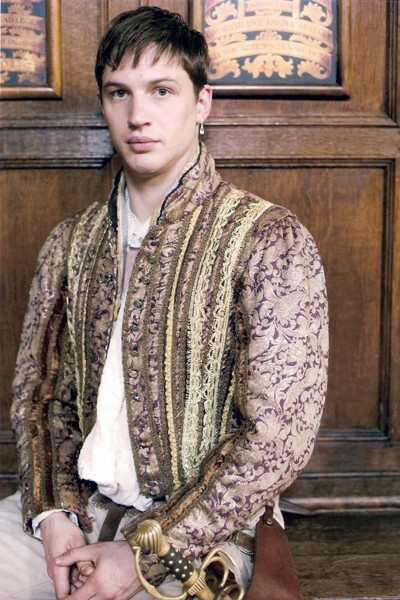 Like anyone, even Ann-Marie Duff’s Elizabeth, is going to resist a kiss from Tom Hardy as Dudley in The Virgin Queen (2006). Obligatory Dudley is obligatory. He’s cute, I suppose, but what the frock is he wearing? Charlie Carrick (Dudley) and Rachel Skarsten (Elizabeth) argue in Reign (2015-). 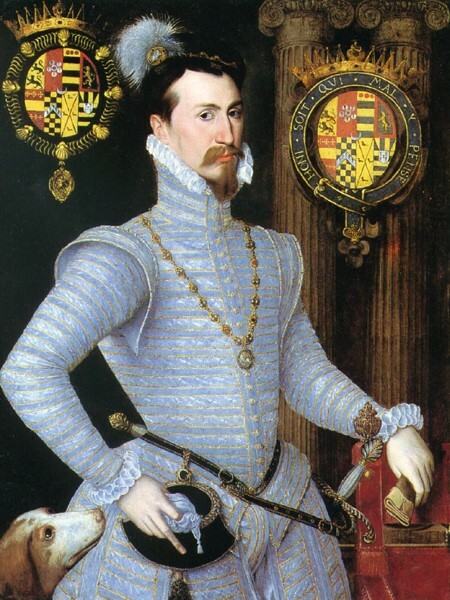 Who’s your favorite movie or TV version of Robert Dudley, Earl of Leicester? Robert Hardy. The role was well-nuanced. Mr Hardy did his research. Well, his mother’s drapes, obviously. And there’s a couple of sofas somewhere who want their trim back. PS: When was the shaving razor invented again? Is it just my age showing or is anyone else thinking of the old Carol Burnett sketch “Went with the Breeze.”? Too bad we never got Dudley in Blackadder II. I got that more from Melchett. And I felt Melchett was Burghley. I agree, Edmund was Queenie’s favorite a la Dudley! If you didn’t have enough reason to adore Robert Hardy, in real life he is an expert in the British longbow! I also read, I believe, that he’s also an expert on falconry. But I believe he wrote a book on the English longbow. And sadly he died earlier this year. Stop it. You make me want to go have an Epic Elizabeth Marathon. I really need to watch Glenda Jackson’s Elizabeth again. It’s been too long. 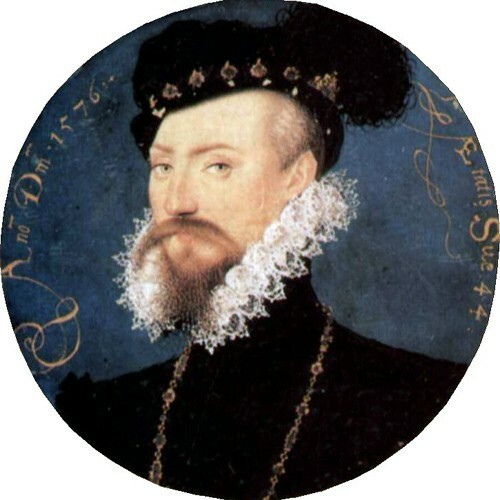 Where IS Robert Dudley in Reign? Not that I hang on every word, but he disappeared at some point and now she’s surrounded by … fictional dudes, I guess? I can’t even remember what happened to him, their explanation for it, nada. Do you watch it? I have to laugh uproariously every week. This go around, it was Elizabeth playing drinking games with some explorer dude (who looks like Fabio in a blonde wig) while a turkey ate pumpkin seeds on the table. Also, last week she had a blueberry pie made, and offered her guest drinks out of cut crystal decanters, while wearing vaguely Elizabethan clothing (if you squint real hard) and standing in a Regency room, full of Victorian furniture. Oh, Reign. You jest with me far too much, forsooth! I’ve only been watching intermittently in the latest season, so I think I’ve seen that Dudley once, at most. I was more entertained by the Reign Darnley, bec. 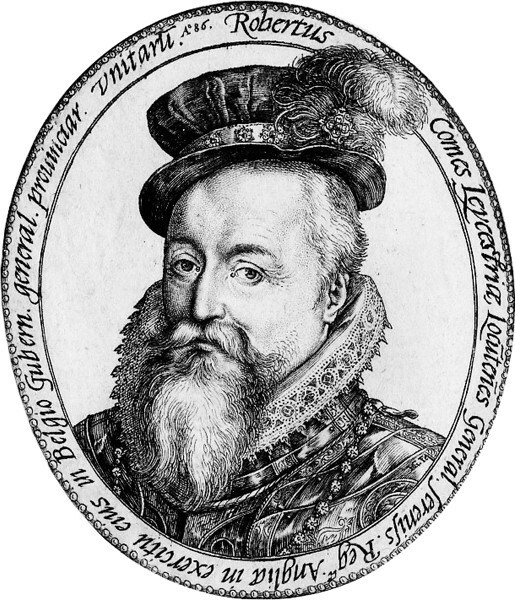 he’s such an OTT jerk, which seems accurate, yet he’s jerky in new & unusual ways than the real Darnley. It’s just *so* Reign, hah. 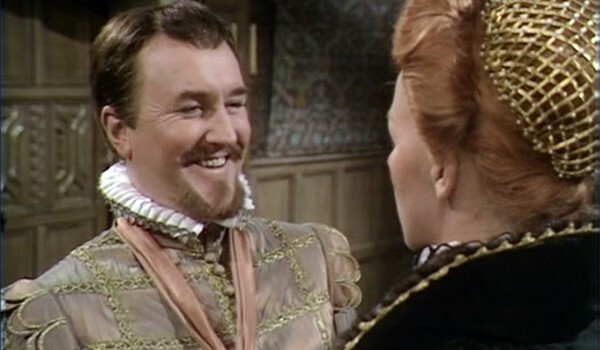 I thought Robert Hardy was a bit too old for the younger Dudley in the early episodes of “Elizabeth R”. But he was fine as the older Dudley. I enjoyed both Joseph Fiennes and Jeremy Irons’ performances as Dudley. I’ve always thot Glenda Jackson was a smidge off as young Elizabeth in the first episode, so that seems fair. But they both hit their stride post-coronation! Thanks for posting this, if for nothing else for Elizabeth I from 2005. I don’t know how it flew under my radar. I absolutely adore Helen Mirren and I’ve always liked Jeremy Irons a lot, too. I’m super excited to watch this now. 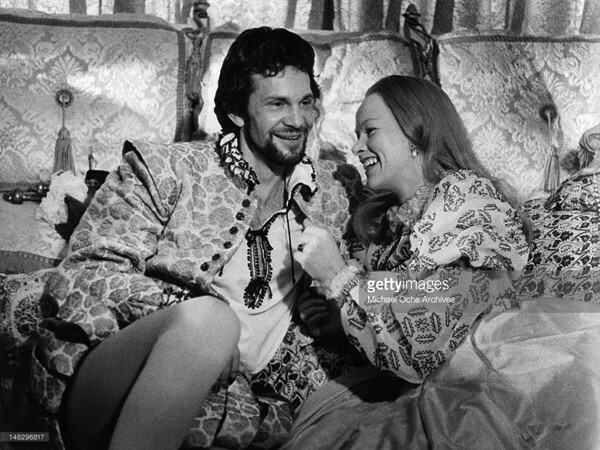 If you liked the opening of the Glenn Close Dangerous Liaisons, you’ll love the Helen Mirren’s Elizabeth. Dumb question: Are Tom Hardy and Robert Hardy related or is it just a coincidence? Not according to his bio. Is he known for wearing one earring? Even my local RenFaire Dudley wears a single earring. Sad to see that the tremendous Robert Hardy has passed away. A wonderful Dudley, a unforgettable Siegfried and a lovable buffoon as Sir John. Robert Hardy sure. But, oh, Jeremy Irons! I did not like Hardy…could not see why Elizabeth would be head ofer heels with him at all. 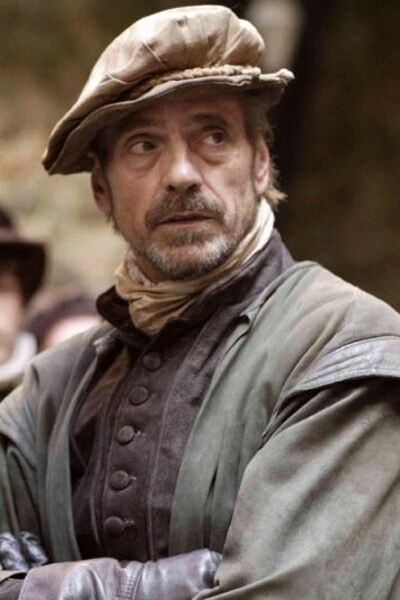 Jeremy Irons my fav by far.